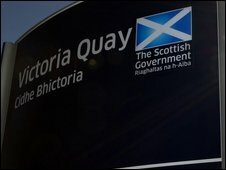 The Scottish Government is failing to hit targets for cutting its own greenhouse gas emissions, new official figures have shown. Carbon dioxide emissions from energy use in government buildings has gone up, while emissions from business travel have also increased. Opposition parties accused ministers of failing to live up to their own hype on tackling climate change. The government recognised it had to lead by example on the issue. The findings came in the latest annual report on the environmental performance of government buildings - which also found targets for reducing waste and cutting water consumption were met. However, energy use in government buildings increased by 2.5% last year - just 2.2% below 1999 levels - while carbon dioxide emissions were cut to 8,082 tonnes, against a target of 7,221 tonnes by March 2011. Last year also saw a 6% rise in business travel emissions, despite more use of video-conferencing. Green MSP Patrick Harvie complained of "all mouth and trousers" ministers. He added: "The bottom line is that without significant u-turns on issues like green energy, public transport, insulation and binding annual emissions reductions, this government will be as abject a failure on the environment as the last one." Alison McInnes of the Liberal Democrats said: "These figures show that ministers have failed to meet their own targets for business travel and building emissions." And Labour MSP Des McNulty said: "The SNP are not living up to their own hype when it comes to delivering on climate change - the Scottish Government's carbon footprint should be getting smaller not bigger." As the report was published, the government announced it had teamed up with the Carbon Trust in a bid to reduce its carbon footprint. It said the £80,000-a-year plan, had the potential to cut emissions by 20% by 2014, compared to 2007 levels. Climate Change Minister Stewart Stevenson said: "This Government is determined to play a leading role in global efforts to reduce emissions. "As part of our drive to create a greener Scotland, we must lead by example and put our own house in order." Green campaigner Richard Dixon, of wildlife charity WWF Scotland, claimed ministers had set an "unambitious" target for reducing total Scottish emissions - comments the government disagreed with. Mr Stevenson said proposed legislation would set a target of reducing Scotland's greenhouse gas emissions by 80% by 2050.